Currently in the process of being brought over from the original Chinese release, Revelation Online is a free to play fantasy MMORPG being published in the West by My.com and we got the chance to check it out during its recent round of closed beta testing. A visually impressive game it offers some open gameplay in a fairly seamless world, other than some instanced raid dungeons we transitioned from area to area without any loading screens. 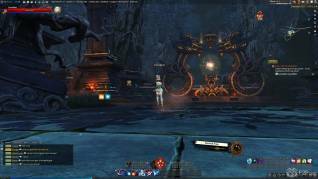 Whilst the exploration itself feels quite sandboxy and players can go where they wish, it is a quest focused story driven title that was constantly edging us to head from area to area and, at least for the first 20+ levels of gameplay, there was little reason to ever stray from that path. The story itself shifts back and forth between the epic and interesting to the absolutely mundane, one moment you're defending your village in the tutorial from some main antagonist and fighting huge crab-like sea creatures on a ship in a storm, the next you're going buying food from a vendor to serve up to your "demon hunter" companion (who spends most of the time watching you fight stuff as an inactive NPC). One of the cool elements of the game, which was more reminiscent of some free to play point and click RPGs, was the ability to switch off the visuals of other player characters whilst you were in your "Story Mode", making it feel like a single player game. 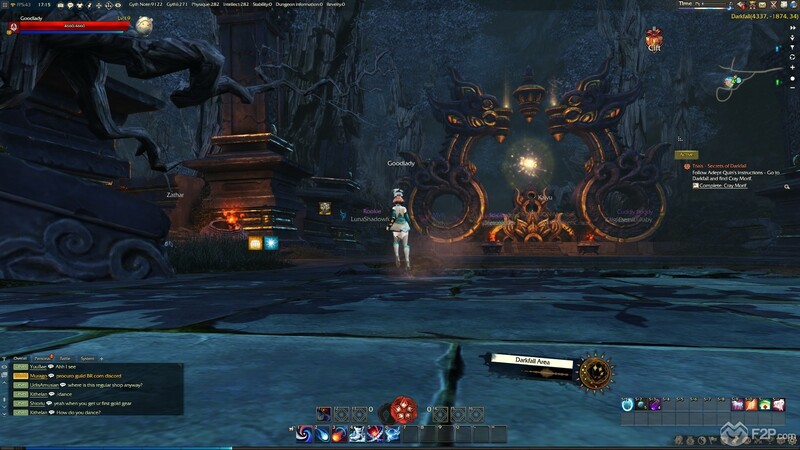 As ever with Asian MMORPGs the character creation/customization was pretty impressive with so many hairstyle options and sliders to tweak the look of your character, it was a refreshing change from the bog standard selection of pre-generated looks and something we always love spending a little time playing with. 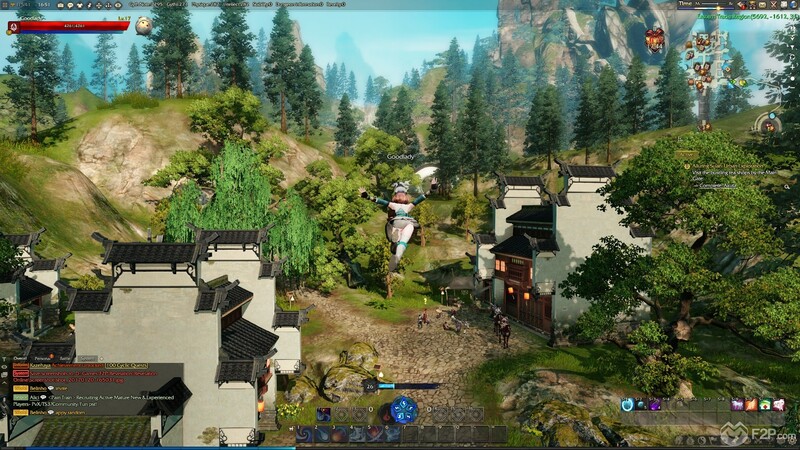 Graphically the game is pretty impressive and performance wise, other than a few slow loads of player characters in some of the busier areas, we didn't experience any performance issues, which is a good job because the combat is extremely fast paced and with the constant need to manually dodge telegraphed attacks marked on the ground, any form of lagg here would be a big issue. As a Swordmage we were a magic focused combatant (the sword element seems to be quite unnecessary as all our skills seemed to be ranged-magic focused) which meant actively dodging incoming attacks, keeping at range and switching between three elemental stances to change the damage output of our primary spells. With our damage charged we could let off a more powerful charged Searing Wake ability, which did some pretty great AOE lighting damage, powerful fireball attack or froze enemies in place. 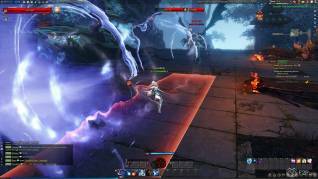 Using a combination of tab targeting to lock onto enemies the game still required us to face our target to fire off a shot, which meant more skill needed than more MMOs offer; similarly with some area abilities like the lightning AoE it would affect the direction you were looking in. Very action focused. 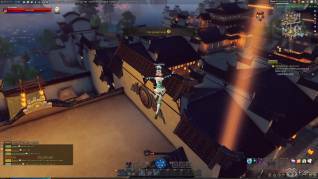 With the prospect of aerial combat later in the game we have to say that the combat options in Revelation Online were possibly some of the best we've seen in an MMORPG for quite a while. Whilst we didn't get to experience aerial combat, or flight itself beyond a taster in the tutorial portion of the game, we can say that it is extremely fluid and the transition from air to ground was really well done and we definitely look forward to actually checking out more extensively. 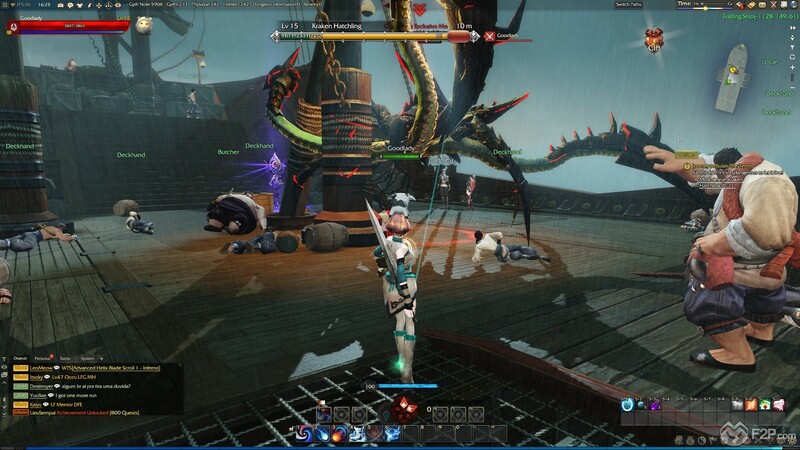 Whilst the actual combat was fun it was frustratingly easy for the first few levels and, as with most MMOs, we wish we didn't have to play for X amount of hours before the game provided any sort of challenge. 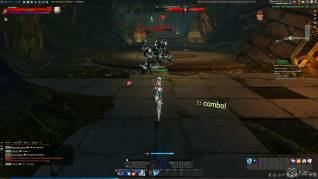 Dodging enemy attacks was important, and perhaps it was getting players used to the learning curve of more active combat as to why it wasn’t so punishing, but there were no moments where we were concerned about dying, apart from one eye rolling exception. Fighting through a "raid" dungeon (the game calls it a raid, but it was a single player dungeon) we ended up facing a huge laser beam shooting giant gorilla that would smash the ground making an earthquake attack (that you could jump up and dodge, which was cool). We fought this particular boss for a good five minutes, whittling his health down until he basically one shotted us and essentially killed us from way above half health, as we awaited the killing blow a cut-scene occurred with an NPC saving us... it was kinda "meh" given that we'd been doing so well on our own killing it, but whatever, story. Overall a good experience, but the game wasn't without its minor annoyances. Firstly mounts seemed completely pointless, with the ability to run at super speed we could run faster than a mount anyway and didn't have the ability to do our super jump and glide whilst on one, making them a completely redundant addition (though we can imagine the uproar of having an MMORPG without mounts). Gear acquisition was, at least this early on, another pointless addition as there was pretty much no customization, nearly every piece of gear we picked up we equipped and didn't have to swap anything out (though again, up to level 20 the stats acquired from gear wouldn't have helped or hindered that much anyway as PVE was easy). Our biggest frustration was, for want of a better word, the "quest breaks". EVERYTHING was a new quest; get a quest to go and talk to a guy, then you'd click through quest completion/reward screens when speaking to him and he'd then give you another quest that you pick up and accept to then go and interact with an object that is right next to him, once you do that you click through the quest complete/reward screen and get another quest to go and talk to him, etc, etc. 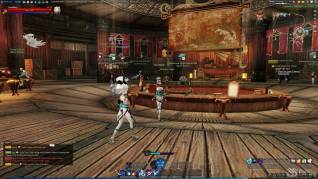 It seems like a little thing but after a good 3 – 4 hours of gameplay it starts to become really noticeable and really annoying; there is no other MMORPG we know of that dissects quests quite as much as Revelation Online and other than reworking every quest chain don't see this one ever being changed. 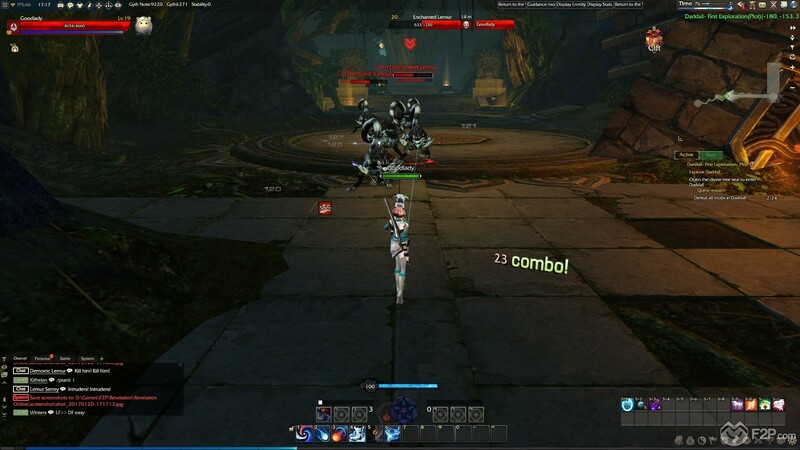 That aside, with combat probably getting more difficult as you level up and the introduction of new features, Revelation Online is definitely one to check out when it finally releases due to the action combat alone.